Twice a year the ARChive weeds through the permanent collection and pulls our third copies of recordings to sell. We also contact all of the record companies and supporters who send their latest releases. The result is a massive record sale of incredible items, and you’re invited! 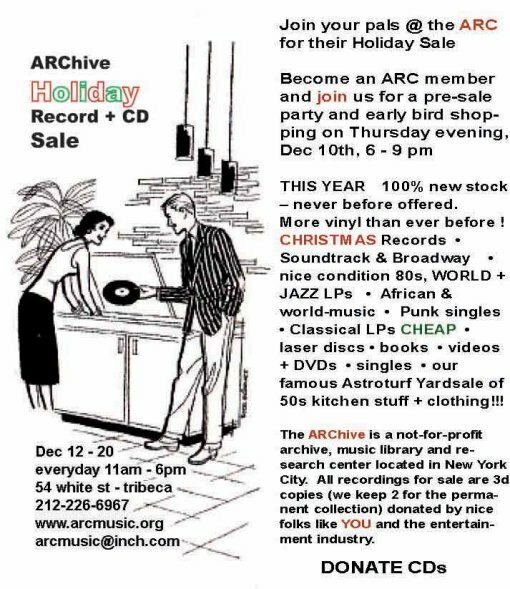 Remember you can join the ARChive and attend our pre-sale party on Thursday evening, DEC 10. Only $50 to join and support the ARC. So click below or give us a call at 212-226-6967 for details! More info about the sale after the jump. Boxes and boxes and boxes of LPs for a buck per LP! The BEST LPs, many in near perfect condition! Never before offerd Jazz, World and Rock LPs. Classic LPs in great condition. As always Broadway cast and film soundtrack LPs. The sale is a cash only event. Most of the recordings for sale are pop & rock. And don’t forget, CDs are NEW donations from record companies, NOT used, returns or defects. Most new CDs at $4. or the J, M, N, R, Z, or 6 to Canal & Lafayette. We offer gift certificates to shop at the ARC – for that very special vynle-ite in your life! All items must be pre-paid. No returns, so be really sure you really, really want it!